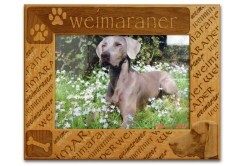 This frame features reverse engraving with a nice image of a Weimaraner hunting dog, and a repeating breed name theme. Frame holds a 5x7 photo. This frame features reverse engraving with a nice image of a Weimaraner hunting dog and a repeating breed name theme. Made of beautiful alderwood, this frame will show off your photo of that special pet in style. Frame holds a 5x7 photo.